John Bald has a gallery of photos he took for Borrowing Bunnies that didn't get chosen for the book (but are pretty cute anyway). The Maine-based rabbit rescue that sent Peggotty and Benjamin to Cynthia's house for fostering was Cottontail Cottage (website). "My family fosters bunnies for an animal rescue. That means that we take care of the bunnies at our home for a few months until they're ready to be adopted by another family. Some bunnies we foster have never lived in a home or been loved. It's our job to teach them how to be good pets for their new family." 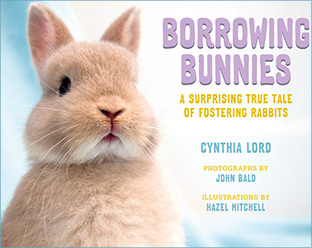 Author Cynthia Lord likes fostering pet rabbits—or, as she fondly calls it, "borrowing bunnies." This is the heartwarming true story of the author's own journey with two very special rabbits, Peggoty and Benjamin. The rabbits had been neglected by their previous owner and were saved by the Cottontail Cottage Rabbit Recue. Cynthia agreed to foster the rabbits and help them learn to trust people and feel safe inside a home. Cynthia's husband, John Bald, photographed the rabbits' every step toward adoption. The book includes delightful spot illustrations by Hazel Mitchell. ©Cynthia Lord. All rights reserved.